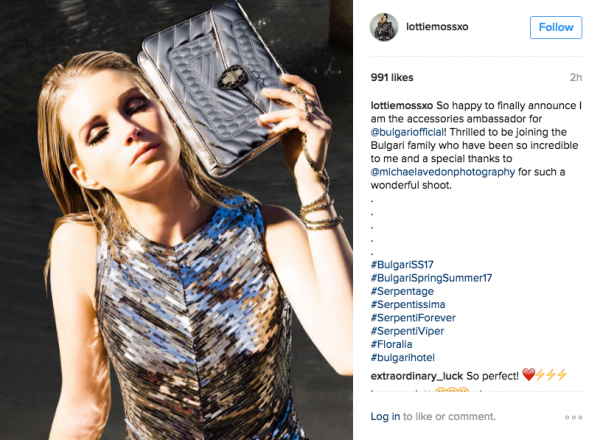 Lottie Moss continues to take the modeling world by storm with her latest coup, a deal with Italian jewelry giant Bulgari as its new accessories ambassador, following in the footsteps of Rosie Huntington-Whiteley, who was tapped for the role earlier this year. As part of the new gig, the 18-year-old little half-sister to Kate Moss also fronts the brand’s Spring/Summer 2017 campaign, which was photographed by New York-based photographer Michael Avedon. The Brit has starred in a slew of other brand campaigns in recent months, like Calvin Klein, PacSun Denim, Adidas Originals, and Tommy Hilfiger, to name a few. She will celebrate the news at Bulgari’s presentation today in Milan, followed by an exclusive dinner. A celebration is in order, indeed!